Use the Hunters Specialties Mag Lift System with Gambrel (rated to 600 lbs) to hoist large game or any other heavy items that you need to lift vertically. This 4:1 pulley lift system will a allow you to lift a heavy animal and is perfect for Deer & Antelope and other large game. Raise and lower game with the hoist while the gambrel supports the deer's hind legs. 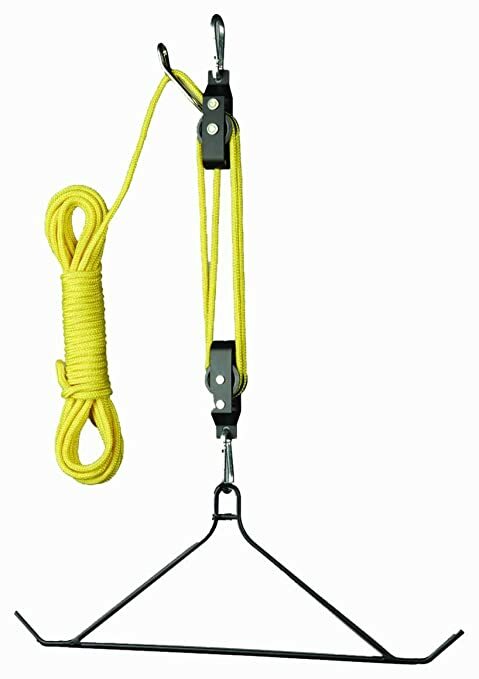 This lift system features a 40 foot tangle free, rot resistant rope, 4 pulley system that is rated to 600lbs. It includes a brake system to hold the animal or item in the lifted position. In a non-Doomsday survival scenario, an example of another use of this lift system would include hoisting engines, generators, lawn mowers, etc, into the back of a pick up truck. Anything heavy that you need to lift and hold in place is a candidate for this lift system to handle. The Hunters Specialties Mag Lift System with Gambrel is a versatile vertical lifting device that can save your back when lifting heavy game or anything else. The following YouTube video is not of the Hunters Specialties Mag Lift System with Gambrel. Instead the following video demos a different make & model of a very similar lift system that is rated to 500 lbs and includes a gambrel. "Wow. Great deal and well made. I used this to butcher a 275 hog. Worked perfectly. Auto-locking design is a big plus." "Excellent....Everything is heavy duty,and very well made,and the brake is a lifesaver. The game won't slide halfway down by the time you get your rope tied off the old fashion way.VERY GOOD !!!" "Nicely made, only used it once this past season but held a deer up just fine. It took me a minute to figure out the lift but once I did, I realized what a nifty little contraption it is. No more tying the rope to the fence to hold the deer up for me." "I was very happy with the purchase. The device worked better than expected and arrived on a timely matter. I like that the rope is water resistant so I can leave it outside during season." "Works Great. I got three deer last year and they all hung from this thing. It was easy to pull them up and the built in break worked great. No complaints from this guy, can't wait to hang some more deer from it." "Made the difference between my back going out and me finishing the butchering. Lifting a 150lbs deer with one hand." "Wicked good construction. Always disliked rope brakes and don't trust them. But this is solid and smooth to use. Will use it until tied off....All told, an excellent product." "Works as advertised. I bought this to replace a one pulley non-locking lift I used to clean whitetail dear. So far I have cleaned a big buck and a doe using this and do not have any complaints. You may need to practice with the locking feature before you pull up your kill. It does not come with directions and it takes so practice to get it to lock." "Solo hunters / You need this. I liked this product because of the pulley break. I often am by myself hunting and do not have the luxury of a big camp with lots of help. For years I hung my deer with assorted pulleys and ropes. After my last real big deer (a 7x5 Blacktail) I decided something had to be done. That deer was tough for me to manage. From dragging to getting it in to the truck to getting him capped and skinned. This product will help in all of those arena's. After it arrived I was pleasantly surprised at how big and beefy all of the components are. It is built well. The break on the pulleys makes it possible for one guy to manage all of the operations and not have to run two ropes and a truck to get your animal in position."